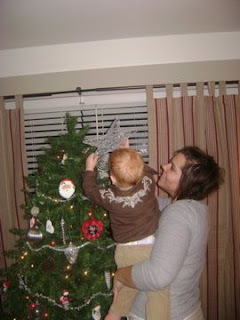 Caleb got to help Mommy put the star on the top of the tree. He loved looking at all the Christmas lights! 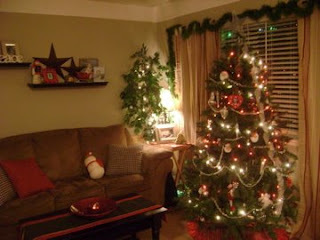 The result: A warm and cozy home for the holidays....I love decorating for Christmas! Jeremy even put up Christmas lights up outside as I was so excited to have a house to decorate for the first time ever! And this year will be the first year we spend Christmas morning at our own place with just the four of us....I'm so looking forward to starting some Christmas traditions with our kids. We also had a first (of many this month) big snow. Even though I was really sick, I couldn't pass up the opportunity to let the kids play in it and make their first snowman. 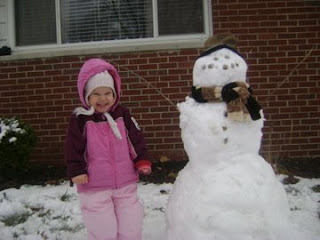 Faith kept referring to the snowman as 'her friend, Snowman.' She kept asking me to take pictures of her and her new friend...they were best buds for the afternoon. 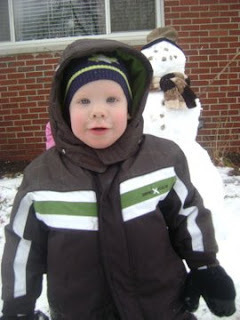 Bubba spent the majority of the time learning how to move in his huge snow suit and boots! Once he did though, there was no stopping him! 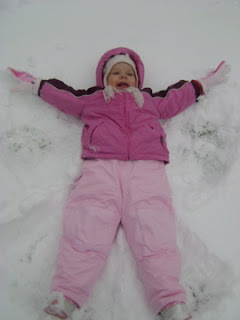 Faith wanted to make a snow angel....she couldn't be more of an angel, she is just getting so big and learning so much over the last couple weeks. She's so sweet and so full of life. What a girl! This picture cracks me up! 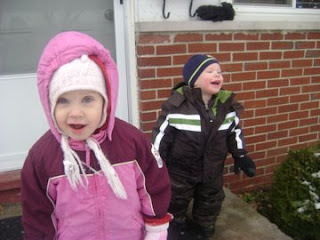 I love the kids facial expressions....it looks like Faith is wrapping and Caleb is singing back up....so funny, they were having a great time! They didn't want to come back in the house! Now the event that consumed most of my time this month was 'Imagine Christmas', a production put on by Rochester Church of Christ. It was a lot of hard work and late nights, but it was such a blessing to finally be a part of something like this again. I love the girls I got to sing with and get to know...they're amazing talents, I feel so lucky to have been a part of it. 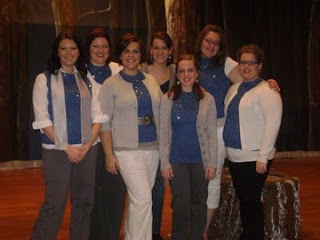 Vicki Lindsey, Sarah Robinson, Me, Teresa Graney, Holly Knutson, Emily Polet, and Beth Bowers: The A Cappella singing angels. It was one of the highlights of the show, Teresa did an AMAZING job writing and arranging the music. 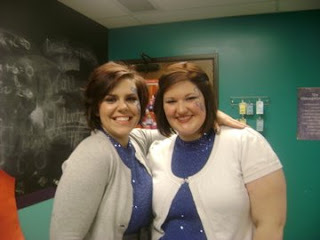 Sarah and I getting ready backstage....I'm so excited to have gotten to spend time with this girl that I never would have gotten the chance to know without this show. She's incredible! I love making new friends! 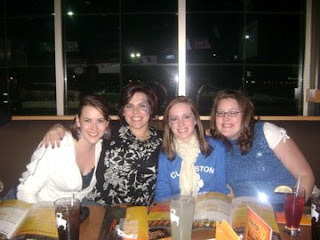 Some of us hanging out at B Dubs after opening night - we were starved! The show was a great success, I got so many comments about the show being such a powerful outreach to people. 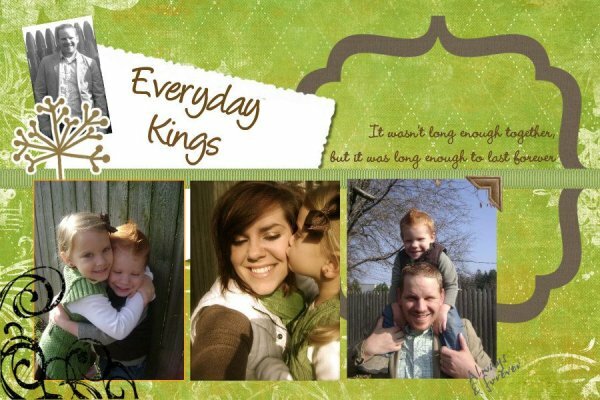 Vicki did a great job putting this vision together, I hope to be a part of it next year! That's a small recap of the last month. 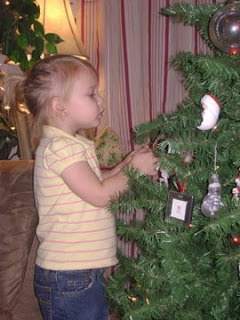 Now onto to finishing up my holiday shopping, working, and getting ready for Christmas!